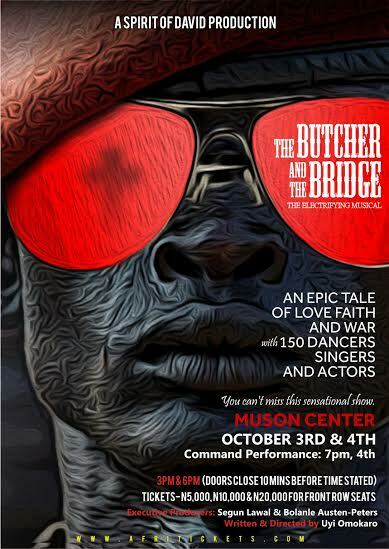 The epic theatre production “The Butcher and the Bridge” Written and Directed by Uyi Omokaro is Spirit of David’s 90th Production. The Butcher and the Bridge is a spell binding tale about war, love and faith theatrically presented in unique, professional and anointed musical theatre. The story itself is fictional but inspired by several true tales woven into its dialogue from recent and global war narratives. As a show, it is guaranteed to impartially address some of the most salient issues on war and terror being experienced in our world today in song and dance that will not only challenge but inspire us. Spirit of David is an indigenous dance company presenting fresh and creative dance pieces on an international stage to today’s dynamic audiences. At the heart of each presentation is a rich blend of cultural, universal and Life-changing themes which are uncompromising and artistic. Since April 1997, what began in the Obafemi Awolowo University, Ile-Ife Nigeria with seven passionate people, has attracted over two thousand members worldwide. After eighty nine shows, two award-winning seasons of Celebrity Takes 2 (a dance-reality TV show), a 12-state road tour of Nigeria, a 10-country tour on two continents and over 3500 stage performances in forty cities of the world. The show holds at the Shell Hall, Muson centre on the 3rd and 4th. 3rd times are 3pm and 6pm prompt. 4th is 3pm with a command performance at 7pm. Tickets are N5k standard, N10k premium and N20k front row patron seat. Command performance tickets sell for N15k, N25k and N35k and are sold in blocks of 10 to corporates and passionate parties. Call 0808DANCING to book tickets and reserve tables.